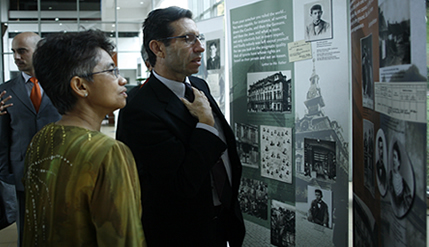 BANGI, 4 Nov 2013 – The National University of Malaysia (UKM) and the government of the Czech Republic had for the second time held an exhibition on prominent figures of the Central European country. The exhibition on renowned Czech author Franz Kafka was held for one week ending last Friday, Nov 1. Franz Kafka (1883 – 1924) was a writer of novels and short stories in German, regarded by critics as one of the most influential authors of the 20th century. Among his most famous works such as “Die Verwandlung” (“The Metamorphosis”), “Der Process”(The Trial), and “Das Schloss”(The Castle), are filled with the themes and characters showing mystical transformations, parent–child conflict, physical and psychological brutality and terrifying experiences of bureaucracy. He was born in Prague, which was then part of the Austro-Hungarian empire but after 1918 became the capital of Czechoslovakia. Director of the UKM’s Institute of Malaysian and International Studies (IKMAS), Prof Dr Rashila Ramli launched the exhibition on behalf of Vice-Chancellor Tan Sri Datuk Seri Prof Dr Sharifah Hapsah Syed Hasan Shahabudin. The exhibition gave some insights into Kafka’s life although his works are still enigmatic. The exhibition was sponsored by the Czech Embassy in Kuala Lumpur, whose ambassador Jan Fury was present at the launching. Also present was Martin Hubinger, the embassy’s Deputy Head of Mission, who had done much to make the exhibition a reality. Fury described Kafka as a reluctant writer whose works almost never got published, if not for the man’s lawyer friend. Kafka had entrusted his last will and testament to Max Brod, a lawyer who ignored the writer’s wish to have his manuscripts destroyed but published the works posthumously. Hubinger, who had put together another exhibition in UKM in 2011, gave a vivid account of Kafka, portraying him as a man of contradictions, lonely and detached. Despite Kafka’s middle-class upbringing, he wrote about situations that were surrealistic – bordering on fantasy and horror. He was a minority in his own country at several levels; born a Jew in a majority Catholic country, he was also a German-speaker in a nation where most people spoke Czech, which he spoke fluently as well. He travelled widely in the German-speaking regions of central and western Europe. He never gave up his full-time job as an insurance investigator to concentrate on authoring because he didn’t have confidence that his works would be accepted. Kafka died of tuberculosis, never having married but fathered a child out of wedlock.